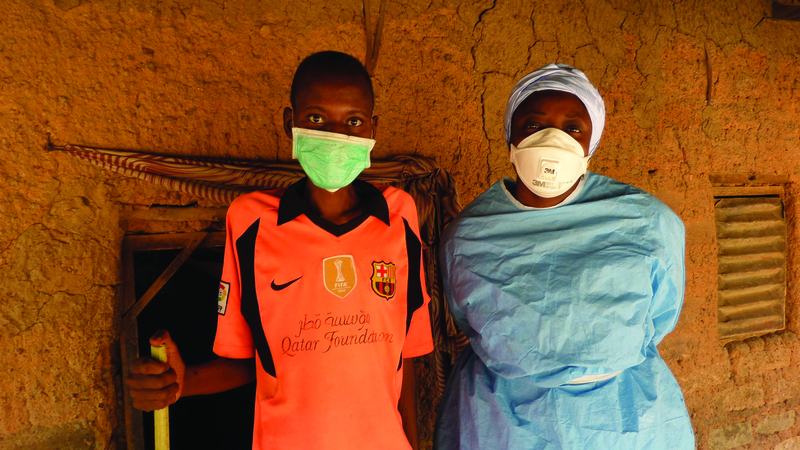 Photo Credit: Two MDR TB patients in Nigeria, Courtesy of FHI for USAID Imagine an airborne disease that can be fatal if not treated, and curable only with a treatment of more than 14,000 pills and painful injections. Imagine having to stay on this treatment for two years or longer, with debilitating side effects of nausea, vomiting, hearing or visual loss and possible depression with suicidal thoughts. All this, while putting your loved ones, co-workers, friends, and others at risk of contracting the same deadly disease if you interrupt and do not finish your treatment. Unfathomable? This is the current plight of almost half a million men, women and children who develop multidrug-resistant tuberculosis (MDR-TB) each year. And yet, those MDR-TB patients detected and put on treatment are the "lucky" ones who have a chance of being cured. Globally, three out of four patients with MDR-TB do not even reach the starting point of this arduous journey, based on recent estimates by the World Health Organization (WHO). It should not be a surprise that the long treatment journey for MDR-TB makes it difficult for patients to continue to successful completion. One in five patients currently interrupts their treatment or are lost to follow up in health services, while for one in ten patients treatment fails. The high cost of MDR-TB medicines also means that resources are stretched, and too little investment goes to patient support systems and care givers. On average, only 50 percent of those who start on MDR-TB medicines successfully complete their treatment, and 16 percent lose their lives to a disease that is preventable by curing TB patients without drug resistance the first time around. Yet, this bleak journey does not have to be the future for people ill with MDR-TB. Today, two new recommendations from WHO offer hope. The first, on a shorter treatment regimen for MDR-TB patients, and the second, on a rapid diagnostic to guide its use. These recommendations can be lifesaving to the majority of MDR-TB patients globally. The new recommendations on the shorter regimen are possible thanks to results from operational research studies conducted by the International Union Against TB and Lung Disease (The Union) with financial support from the US Agency for International Development (USAID), and by Medicins Sans Frontières (MSF). Results demonstrated that treatment duration and medicine costs can be cut in half without compromising survival of the patient. For many patients, this makes the difference between life and death and the avoidance of financial hardship. This also implies more resources will be globally available for the prevention and care of MDR-TB. However, prescribing the regimen to MDR-TB patients who have additional resistance to fluororquinolones or injectables carries grave risks, and may lead to the development of extensively drug-resistant TB (XDR-TB). To address this concern, and quickly determine which MDR-TB patients are eligible for the shorter regimen, a novel and rapid commercial molecular diagnostic test (MTBDRsl) is now being recommended by WHO for use in national TB reference laboratories. This test will be able to detect resistance to fluoroquinolones and injectable drugs. Results will be available in 24-48 hours down from the three months, or longer currently required. An additional benefit of implementing the MTBDRsl test is that newer drugs such as delamanid or bedaquiline can potentially be prescribed at the start of conventional longer regimens and thus lead to higher cure rates. Nevertheless, no data are available on the use of these new drugs in shorter MDR-TB regimens and WHO does not recommend this or their use together at this point. The positive implications of these two innovations are manifold. First, they will greatly benefit patients with MDR-TB, who often face high costs related to diagnosis and treatment. Many such patients lose their jobs, which mean a loss of income for themselves and their families. The economic repercussions are catastrophic, especially when the patient is the breadwinner of the family. However, the implementation of these new recommendations may take time and present some challenges at country level. WHO and USAID are working closely with technical and funding partners to ensure adequate resources and support for the uptake of the rapid test and shorter, cheaper regimen in countries. Prevention of MDR-TB through proper care and treatment of drug-susceptible TB is the first priority; quick identification of those with MDR-TB (using a rapid test for rifampicin resistance as a reliable proxy) is a next critical step. Expansion of rapid rifampicin resistance testing would greatly reduce delays in MDR-TB diagnosis and access to treatment. Second, cost-savings from the shorter MDR-TB regimen would enable many more patients to be tested and treated, while lowering the burden for monitoring of MDR-TB treatment on health systems and health workers. Where to next? USAID is currently supporting a randomized controlled trial by the International Union against TB and Lung Disease in five sites to assess the utility of shorter MDR-TB regimens and evaluating the efficacy, safety and benefits of including the two new drugs, bedaquiline and delamanid, in such regimens. Results are expected in 2020. In addition, USAID is supporting the implementation of the White House National Action Plan for Combating MDR-TB (NAP), released late 2015. The plan identifies a set of targeted interventions that address the core domestic and global challenges posed by X/MDR-TB. These interventions represent the U.S. Government's contributions to reversing the worldwide spread of MDR-TB and can help inform policy development processes around the world. The NAP is an effort to articulate a comprehensive strategy, and to mobilize political will and additional financial and in-kind commitments from bilateral and multilateral donor partners, private-sector partners, and governments of all affected countries to increase their support to prevent the spread of more expensive and dangerous forms of XDR-TB. With the breakthroughs of a rapid test for second-line drug resistance and a shorter, more effective, regimen, we may be at a turning point in our efforts to tackle drug-resistant forms of TB. Yet, MDR-TB remains a public health crisis, and we still have a long way to go. Most pressing is the need for rapid diagnostics closer to the point of care, shorter regimens and new drugs to treat the disease. While countries implement these new recommendations, research towards ultra-short regimens, such as those under trial by the TB Alliance and those supported by UNITAID, need to continue without distraction. This is not the end of the war, it is not even the beginning of the end, it is, perhaps, the end of the beginning. If we unite efforts and resources, we can forge ahead to end TB and MDR-TB.